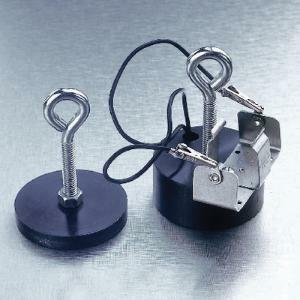 This compact electromagnet is able to lift 100 times its weight, or up to 200 or 500 (large magnet) pounds, with only one or two 1 1/2 V D cell batteries as a power source. This is due to precision machining of the flat surfaces (core and yoke). With this electromagnet you can demonstrate holding force, induction, and dependence on current, as well as explore the magnetic field around an electromagnet.